The Brandon Magic Dakin Barlow (MDB) is available in four versions - with Brandon or standard 1.25" threads, and with 1.25x or 1.5x magnification factors. This listing is for the 1.25x barlow with Brandon threads. This small Barlow is amazing. It is a true Dakin Barlow in a small package, made with a superb lens, manufactured in the USA. This MDB has Vernonscope Brandon threads. Owners of Brandon and Questar eyepieces use this MDB directly on the eyepieces with no adapter. To screw it onto the nosethread of a binoviewer or the standard thread of non-Vernonscope eyepieces, you will reqire a thread conversion adapter (sold separately). The goal is to improve the usability of all binoviewers and eyepieces in addition to providing magnification. Screwed onto the nosepiece of a binoviewer, it gives a bit more back focus (focuser in-travel). On an eyepiece, it gives a little more eye relief. It also increases the f number of the telescope, making all eyepieces work just a bit better. An f/6 scope with a 1.25x MDB will become an f/7.5. Because of its small size, and the way it screws onto the filter thread of the eyeiece, it fits into 1.25" eye tubes and adapters. Even though it is small, do check when using with a diagonal to make sure you have clearance from the bottom of the MDB to the mirror surface. This barlow provides a nominal magnification factor of 1.25x which is an estimate of the magnification achieved when screwed onto the bottom of eyepieces. When used on binoviewers, the magnification will be higher because of the longer optical path. 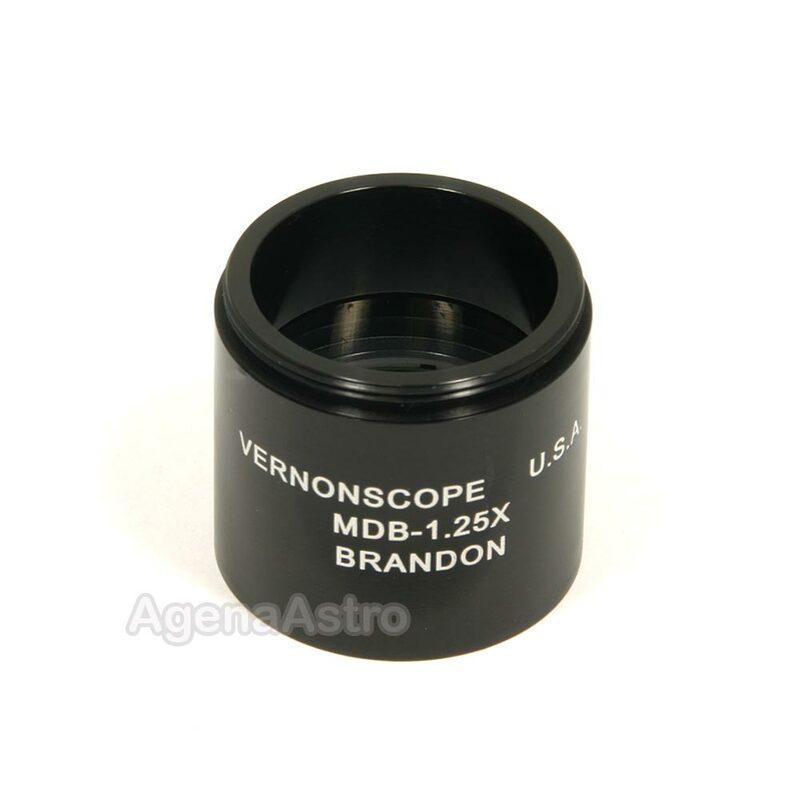 For the Vernonscope binoviewer, with an optical path of 80mm, the 1.25x MDB will provide approximately 2.9x magnification. I have a C14 and use a small pixel planetary camera. This little Barlow gave me the perfect arcsecond/pixel ratio!